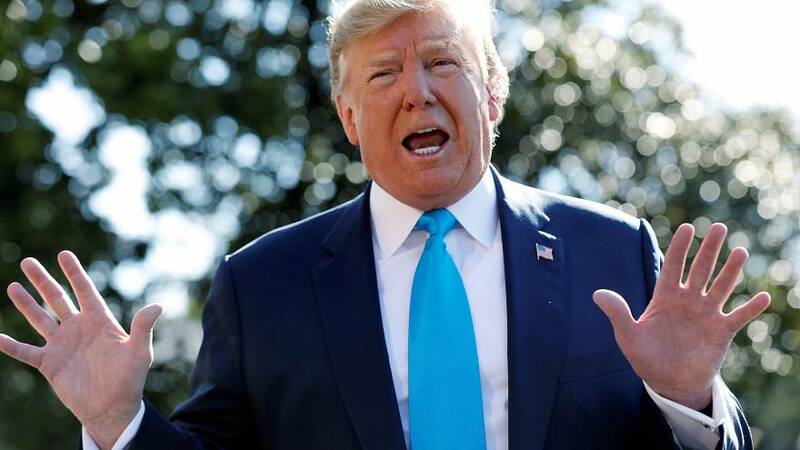 WASHINGTON — President Donald Trump said Thursday that he knows "nothing about Wikileaks" hours after the arrest of the organization's founder, Julian Assange, and two-and-a-half years after he frequently cited its information dumps about Hillary Clinton during his first campaign. "I know nothing about Wikileaks," Trump told reporters at the White House. "It's not my thing. I've seen what's happening with Assange." Assange was apprehended Thursday morning at the Ecuadorian embassy in London, where he had been granted asylum for nearly seven years before Ecuador allowed British authorities access to take him in. He is charged in the U.K. with skipping bail, and U.S. officials want him extradited in connection with an existing charge of computer hacking revealed by the Justice Department Thursday. During the 2016 campaign, Wikileaks disseminated emails that were taken from the Democratic National Committee just before the party's convention that summer, and later released pilfered tranches of Clinton campaign chairman John Podesta's private emails every day for a month leading up to Election Day. "I hope people are looking at the disgraceful behavior of Hillary Clinton as exposed by WikiLeaks," Trump tweeted Oct. 11, 2016. "She is unfit to run." "WikiLeaks emails reveal Podesta urging Clinton camp to 'dump' emails. Time to #DrainTheSwamp!," he tweeted Nov. 1, just a week before the election, from Eau Claire, Wisc.